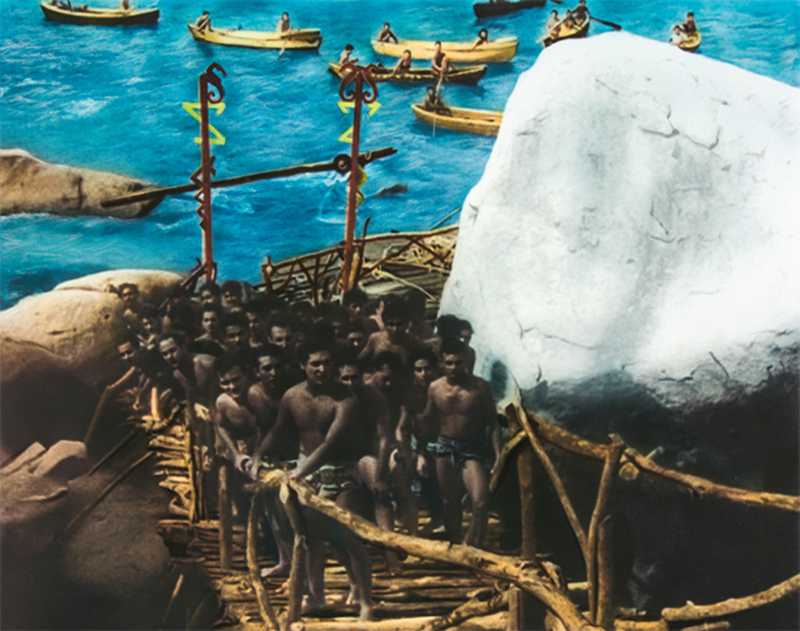 Cristóbal Gracia, Simples y primitivos (Simple and Primitive), 2016, watercolor and pastel on ink-jet print, 28 3/8 × 34 1/4". Cristóbal Gracia was hailed by the press as one of the “most rewarding discoveries” of the 2016 Gallery Weekend Mexico. This was in response to his takeover of gallery Cuarto de Máquinas’s newly opened space with the solo show “Aquatania: Parte I,” curated by Inbal Miller and Edgar Alejandro Hernández. Immediately striking, as one entered the first of the two rooms, was the color of the walls––a beautiful, floral shade of pink, which, as it turned out, matched the hue decorating the interior of the Hotel Los Flamingos in Acapulco, the long-term residence of Johnny Weissmuller, the actor and professional swimmer who starred as Tarzan in a dozen films shot in the 1930s and ’40s.